Do you ever feel as if you are praying wrong? I doubt that I'm the only one who feels this way. Sometimes - especially since becoming a mother - my prayers feel all wrong. I shared about this a little bit over at Ignitum Today. 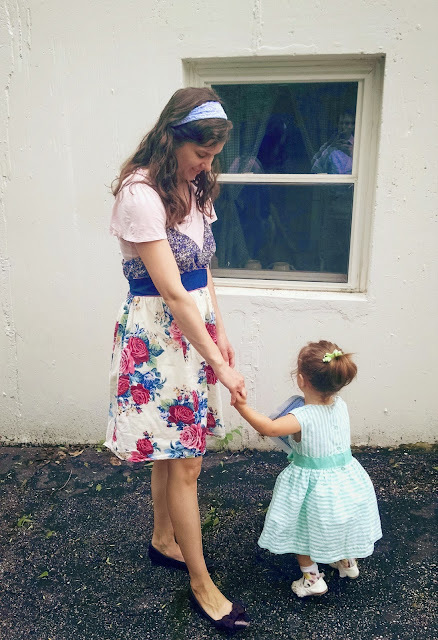 I just find myself going through more dry patches of prayer than usual, since becoming a mother. As I shared last week, I've found that it helps me to have regular, set prayers and prayer times. For me, that means praying several of the hours from the Liturgy of the Hours. I've loved the psalms since I was a child, and I find that they often put into words what I can't. So the Liturgy of the Hours is an excellent fit for me. And as I said last week, the Liturgy of the Hours isn't for everyone, and it certainly isn't the only form of structured prayer. The rosary is another popular one, as is the Angelus and both can easily be spread over the course of the day, or prayed multiple times a day. I think that we are (sadly) in a culture right now where what is right is often determined by what feels right. If something makes you feel good, it can't be wrong...right? And if something doesn't make you feel good, it must be wrong...right? One of the areas of life that has suffered most from this mentality is marriage. Not in love with your spouse anymore? You deserve happiness! Divorce them! Find someone who will make you happy? Attracted to people of the same gender? You should be happy! Pursue the relationship! You have a right to be as happy as anybody! Unfortunately, none of these things leads to true happiness. True happiness is found in pursuing the good, not in pursuing what merely feels good. Happiness doesn't always feel good. Rather, it is a state of goodness itself, a state that often includes good feelings, but which is good even without those good feelings. Let me give you a concrete example. As regular readers know, I had hyperemesis gravidarum during both of my pregnancies, and was pretty sick for the better part of a year, both times. Pregnancy is not a "happy" experience for me, in that it leaves me feeling pretty miserable. But in pregnancy, I find true happiness - I am suffering for love, and it helps me learn to love another with sacrificial love, a Christ-like love. Even when it doesn't feel good, it ultimately leads to my true happiness. I can give you an even more concrete example. When the weather gets warm, I try to exercise as many days as I am able. The neighborhood we're in is ridiculously hilly, and I'm usually biking with 60ish lb behind me, or pushing that around that amount in a stroller in front of me. There are times (like in the rare flat stretches in the neighborhood) where I do enjoy those walks, but there are also some stretches that are absolutely miserable. Yet, those walks make my body feel so much healthier. I suffer from very mild PCOS, which affects my fertility, but which also affects my weight (at least since my pregnancy with Therese it does). When I eat right and also exercise, my body looks and feels much healthier. I don't always feel happy feelings while doing it, but I know that it leads to a greater happiness. The same is true for prayer. Just because I don't always "feel good" when praying, doesn't mean that the prayer isn't leading to my true happiness. Ultimately, my true happiness (and yours, too!) lies in perfect mystical union with God, in heaven. But, the process of getting there is not an overnight thing. It takes time, and it takes stretches where praying is boring or stressful or anxious. Anything worth having - a healthy marriage, a beautiful child born of a tough pregnancy, a healthy mind and body - takes time and effort. And a relationship with God is worth having more than anything else. So, suffice it to say, there will be painful growth periods in a healthy prayer life. Most likely, if you feel like you're praying wrong - if your prayer feels dry and emotionless - you are probably doing everything right. In fact, you are probably in a period of tremendous growth in your faith life. God will give you the grace you need, if only you ask. But, you also must be committed to praying, even when it feels like you're doing it all wrong. I'll tell you another kind of prayer that's really challenging - praying with children. There are some times that I really love praying with my girls, but more often than not, prayer time is loud, and busy, and totally unfocused. People are screaming (ahem, in-residence toddler, ahem), talking, playing, wiggling, and it can be just plain crazy. But even in those moments, it's worth doing - even if only in a very small way. 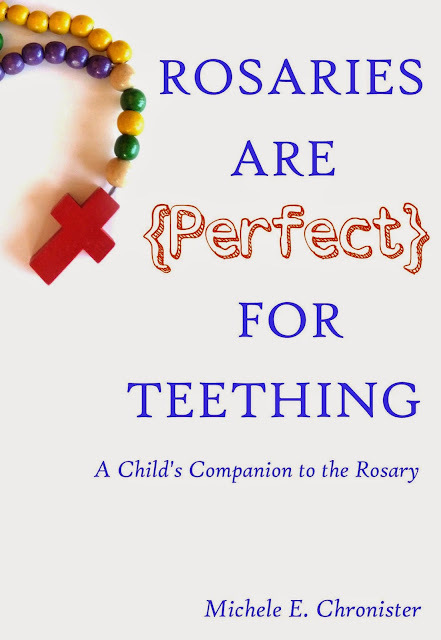 So, on the heels of the success of the rosary book, I'll be releasing a sequel - a companion designed just for praying with your children. It's a very simple book. And did I mention it's written primarily in verse? I wanted it to be something beautiful that you could read aloud, even if only one short prayer at a time. In my experience, most rosary books for children are either majorly dumbed down, or are written at a level too high for children to understand. This one is simple, but theologically sound, and each prayer is designed to help your child imagine that she or he is actually in the mystery. I don't have a release date yet, but I hope to release the e-book soon! I want to share it with all of you, during this beautiful month of May, the month of Mary. More details coming soon! Have a lovely rest of your Monday, friends! 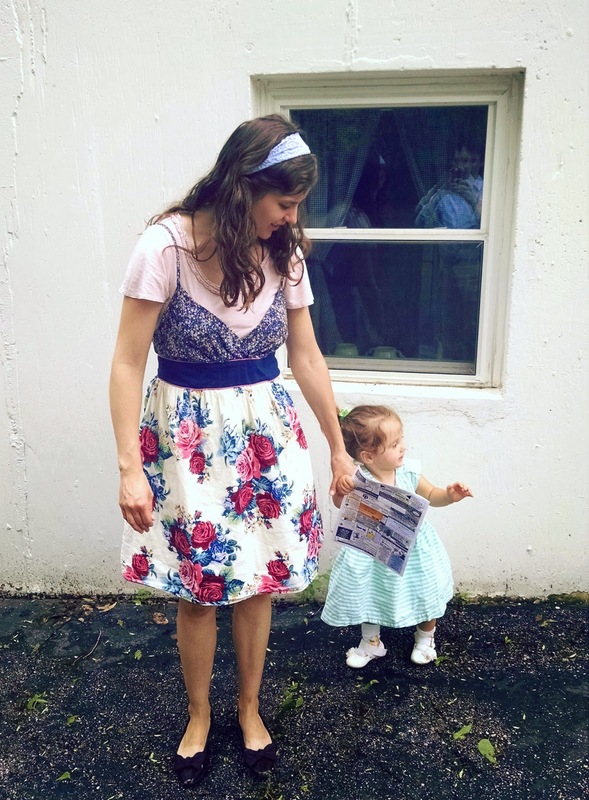 I loooove your dress - thanks so much for linking up with us!